The VPA has its origins in a number of laws and by-laws promulgated by the Pakistani authorities after the partition of India and Pakistan in 1957. During the communal violence that ensued after partition, large numbers of Hindus migrated from East and West Pakistan to India, and Muslims from India to Pakistan. In order to administer and manage the huge amount of left-behind properties, the Pakistani government passed a series of laws that gave it almost unfettered access to Hindu lands, especially those belonging to Hindu elites and Zamindars. Living under the constant threat of losing everything. Interestingly enough, Muslims residing in India were exempt from this Order; thus, from its inception, the Enemy Property Act demarcated Hindus as an inevitable Other – the “enemy” of the state. Moreover, under this Act, the government was the custodian of the property of the absentee owner. If the person returned to Pakistan after the war, he was entitled to get his property back from the government. In reality, however, very few Hindus, if any, were redressed. After Bangladesh gained independence in 1971, the government of Bangabandhu Sheikh Mujibur Rahman promulgated the “Laws of Continuance Enforcement Order, 1971” to keep in force all laws that were in place in East Pakistan till March 25, 1971. The Enemy Property Act was retained even though it clearly contradicted the secular ideals of the new nation. As advocate and activist, Shubroto Chowdhury argues, “Our Constitution guarantees that no 'black laws,' that existed in East Pakistan, meaning laws that grossly violate human rights and are anti-people, would continue in Bangladesh. To remain true to the spirit and values of independence, we should have declared the law dead then and there.” But instead of redressing the Hindu population, the communal act was given new life in the newly independent Bangladesh. In 1972, it was renamed the Vested Property Act, and in 1974, it was finally declared void. However, since then, no systematic attempts have been made to redress Bangladeshi citizens affected by the law, and the law continues to be evoked by local and political elites till date to appropriate new lands from Hindus. The lives and livelihoods of millions of Bangladeshi Hindus are severely hampered as a result of this law. Sujit Kanti Paal and his family from Bakhshali thana in Chittagong is among the 27 lakh households directly impacted by this law. In 1971, one of Paal's uncles left for India. According to Hindu inheritance laws, the property he left behind should have gone to his family members still residing in Bangladesh. But the land was declared as vested, and consequently leased out to a well-off Muslim family. In 1981, some powerful local elite took the land of another uncle who had been martyred during the Liberation war by presenting forged documents. Paal says, “We were poor and uneducated and we didn't know how to protest. The said elite was an advocate himself, with good relations with the police, tahsildars and land administrators, and he just came in with his goons, divided our home in half and grabbed the land. Everyone told us protesting would be of no use, that they would declare the land as “vested” anyway and take it from us.” Paal's family was continuously harassed and persecuted till they were forced to comply. It becomes apparent from these stories that the local powers that be are intricately linked in the misuse of this law, and have a vested interest in maintaining the status quo. The political parties also benefit from it, especially the party that is in power at any given point in time. As such, there is no real push in the policy-making circles for progressive change. 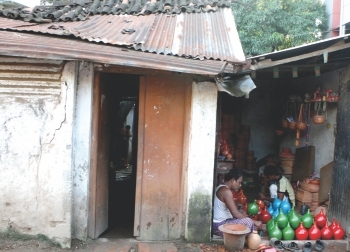 After consistent demands for redress from affected communities and human rights activists, the Government led by the Awami League promulgated the “Vested Property Return Act, 2001” near the end of its tenure. Among other salient features, the act states that properties be returned to their rightful owners, that a public gazette be published within 180 days of the act's enactment with a list of returnable vested properties and that special Tribunals be set up in each district. 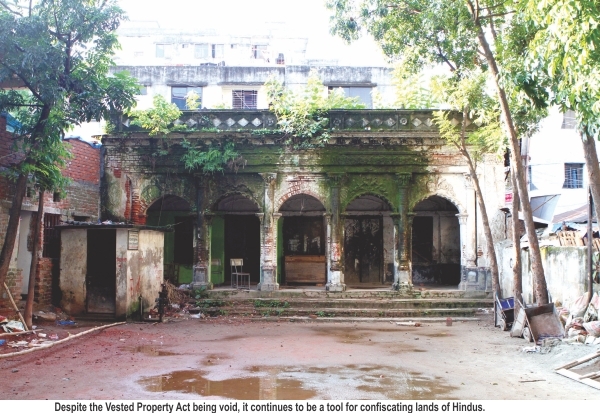 Although this was the first attempt by any regime to redress the Hindu community, it fell short in a number of aspects: the act defined 'vested property' as those vested by 1969, when in fact the majority of Hindu lands were declared vested after that date; it does not provide compensation to those whose lands have already been sold or leased to others and it demands that a person be a “continuous” citizen of Bangladesh to be eligible for redress, which leaves room for discrimination. In 2002, the BNP-Jamaat led government passed an amendment giving the government unlimited time to return the vested properties and the DCs full control of the properties till tribunals are set up. This amendment has hindered any meaningful transfer of land to affected communities. The Vested Property Return Act (Amendment) Bill is supposed to be tabled in the current parliament session, but whether or not the Bill is ultimately passed and brings about positive change remains to be seen. 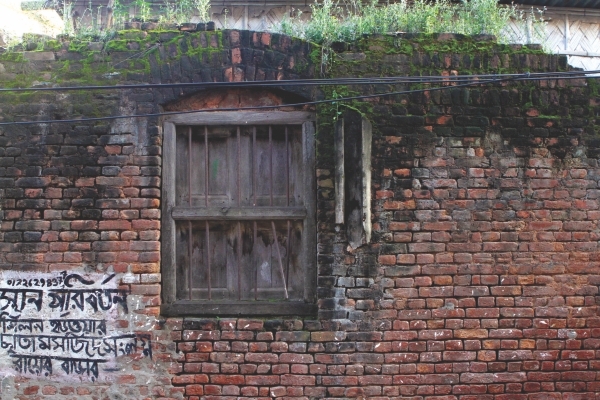 The civil society, like the affected communities, is pessimistic, but they refuse to give up the hope for a Bangladesh free from exploitation.